‘Krootin: Chris Davis commits, etc. Cool picture of Davis, but I'm even more intrigued by Woodlawn's African-American Colonel Reb back there. It’s hardly news by now, having broken Saturday morning, but if you missed it somehow: Woodlawn athlete (and very likely future corner) Chris Davis became the 23rd commitment for Auburn’s class of 2010 last weekend, as expected. There is not a single player in the Yellowhammer State more likely to make a man miss on a given play. Players like Stanhope’s DeMarcus Milliner may be just as good, but I’d need to see reels of game film to be convinced they are any better playing the game now than Davis. Davis has legit height, legit size and a dazzling array of moves not seen on area prep fields since Deuce Palmer lit up Friday nights. Davis scored 60 of the team’s 109 points this year. He ran for 877 yards. The official average was 6.5 yards per carry. Anyone who saw Woodlawn try to block and tackle on a consistent basis would know Davis got at least 450 of those yards on his own. His presence at Woodlawn underscores how even elite recruits can fall through the cracks. The Colonels do not have the resources of other state programs. It’s hard for Davis to go to those elite recruiting combines and evaluation camps for those Web analysts to ply his wares against the likes of the household names with the kids and all the stars. There’s more here. So, who you gonna trust: the gurus, or the Auburn coaches, high school coaches, and high school writers who have watched him play and given him this kind of seal of approval? Davis is expected to be added to the News’s postseason “Super Seniors” list, whenever that comes out. So now that the Tigers have a player who reminds me so much of Miller–and a coaching staff whose track record with spotting undersized talents like Demond Washington, Anthony Gulley, etc.–it’s safe to say I’m quite, quite happy to have Davis aboard and more-than-a-little interested in seeing what he can accomplish at corner. Elsewhere: Decision-time for early enrollees. According to Beaver Wednesday is Signing Day for any recruit planning to enroll in January and get back-counted into the 2009 class … and if you’ve been following Auburn recruiting, you know that Chizik and Co. are looking for as many as five early-arrivers to fill in the available slots from last year. Two of those five we know: Craig Sanders and Friday Google-surveyee Jessel Curry, who I’ll take this brief moment to congratulate on his Buford team’s third consecutive state championship. Shaun Kitchens is also listed as a December grad at Rivals, so he may be a third. But amongst potential last-minute commitments, there’s two JUCO names to keep an eye on: Ken Adams, who may or may not switch his commitment from Tennessee, and Roszell Gayden, the mammoth OL who Chizik visited this weekend and will decide on Wednesday. 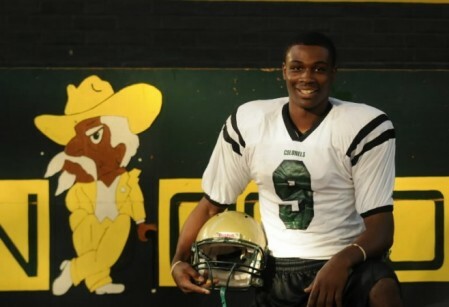 JUCO TE/OL Brandon Mosley is also a possibility but apparently Ole Miss is leading there. It almost goes without saying, but I’ll say it anyway: getting these guys enrolled early would be huge for Auburn. Each player that slips back to the ’09 class equals one more open spot in the ’10 class … and brings Auburn another step closer to getting back up to the maximum scholarship level as quickly as possible. These next two days are, somewhat quietly, going to be very big for Auburn’s program. I really enjoyed the article on recruiting. I especially enjoyed the reference to Milliner. That guy has shown to be a good combine guy, but not completely a good football player. His Stanhope Elmore team was average and lost numerous games where an “elite” talent like Milliner could have pushed his team through to victory. I can’t wait to see Davis in the blue jersey. Welcome Chris and War Damn Woodlawn High!! I’d say that scholarship offer worked out pretty well.